Makes me cringe every time I see my inlaws pulling their LXI around with no transom straps. Yet another reminder of why they might be a good idea. 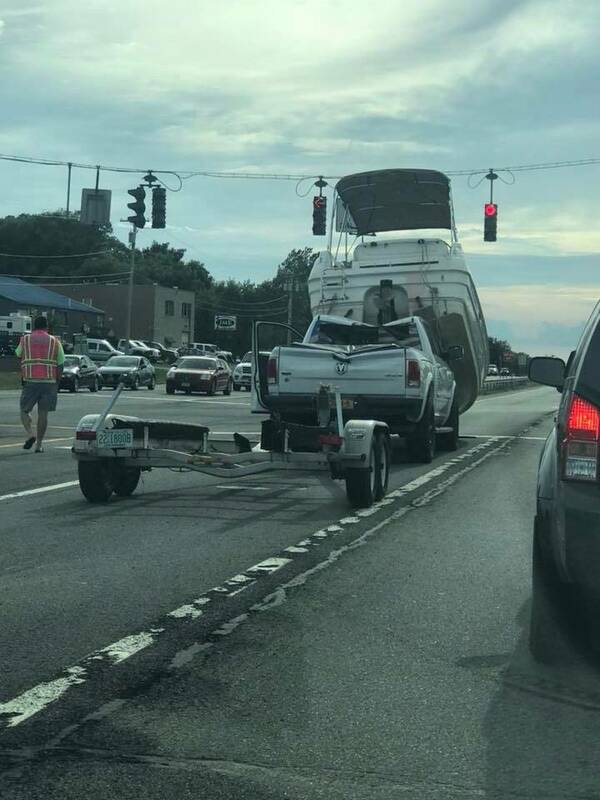 Got to wonder if that thing was tied down at all since there doesn't appear to be another vehicle involved, just braking? Those are some impressive brakes. Boatbuckles are worth every penny. One of the first things I added when we got our Bu. 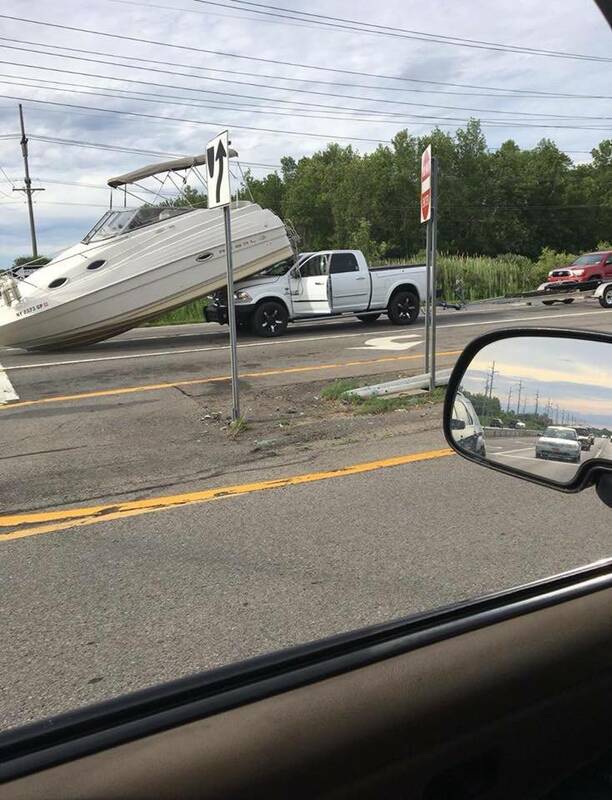 Every time the boat is loaded it's strapped down. With the old removable style sometimes you can forget or sometimes you don't put them on for short trips or maybe they're buried under all your other gear in the back of the truck etc. I sprayed my carpet bunks last week and the boat can inch forwards and backwards an inch or so with every stop and acceleration. I really have to cinch it down front and back and I'm adding a bow strap in addition to the winch. More pics here. Apparently black ram in one of the other pictures stopped and towing truck slammed on brakes. After they finish lifting the boat with pinch points in the center of the boat I might expect to see much more damage to the boat. I bet the bunks were wet, curious how it would have looked if the truck was made from aluminum. 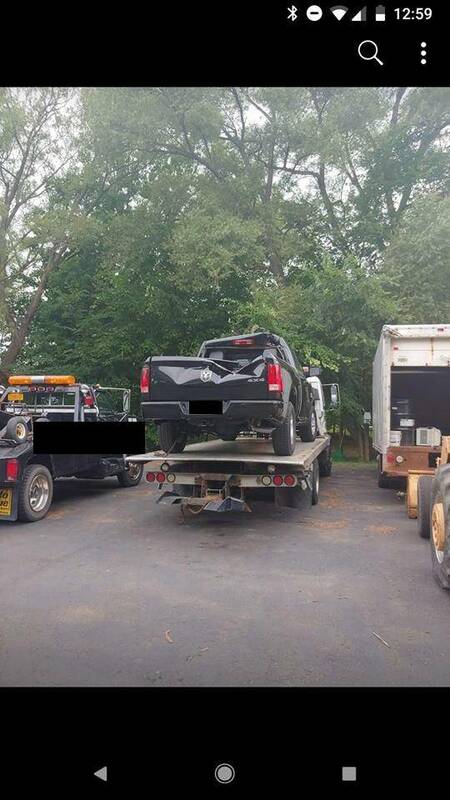 This is the truck it landed on. There's a Dodge Ram joke here just waiting to be written. Actually both trucks held up pretty good, that was a big boat. I wonder what pulled the guide poles forward? Maybe he strapped to those? Is there anywhere that actually has a news story about the accident? Or just photos and speculation? There were mooring ropes tied to them. You can see the remnants of them hanging from the transom of the boat. Did you mean Dodge Ramp?